Police have arrested 43 gay rights activists, after saying their protest blocked entrances to the Idaho Senate chambers for more than two hours demanding protections for LGBT individuals. .
Former state Sen. Nicole LeFavour, the Idaho Legislature’s first openly gay lawmaker and an organizer of the protest, had said the group would block the entrances until lawmakers agreed to take up a bill adding protections for gay and transgender people to the Idaho Human Rights Act. If lawmakers “get a bill through committee, we would let them in to do their work,” said LeFavour, before she and the others were arrested. 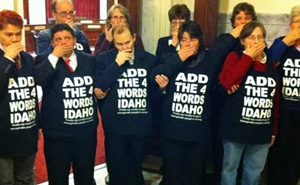 The demonstrators wore “Add the Words Idaho” T-shirts and covered their mouths with their hands, a symbolic gesture intended to call attention to a bill adding workplace and housing protections for gays, lesbians, bisexuals and transgender individuals to state law. Hill, Rand other Idaho Republicans have blocked passage of such a proposal for eight years. Hill said he sought to avoid a confrontation by telling his members to remain outside the chambers until the protesters had vacated the entrances. Protesters, who ranged from high school age to their 60s, said they wanted to make a point.